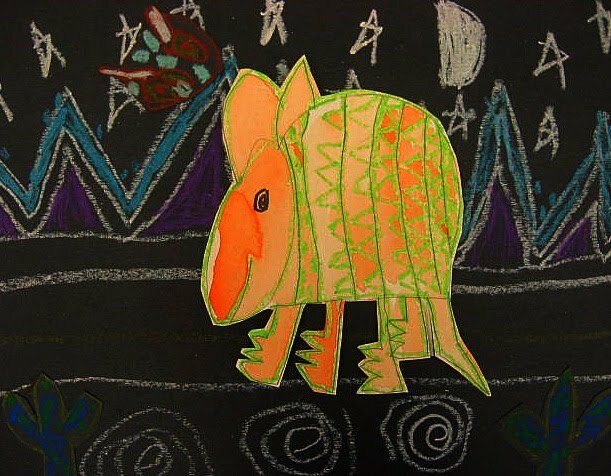 I did provide a crescent shaped head template so the children could feel comfortable in beginning their piece and eliminate the pinhead syndrome :) (something I don't always do) From there we followed a loose direct line drawing lesson. 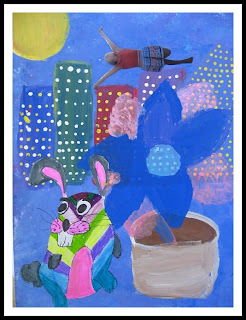 They completed their art works with oil pastel and watercolor. 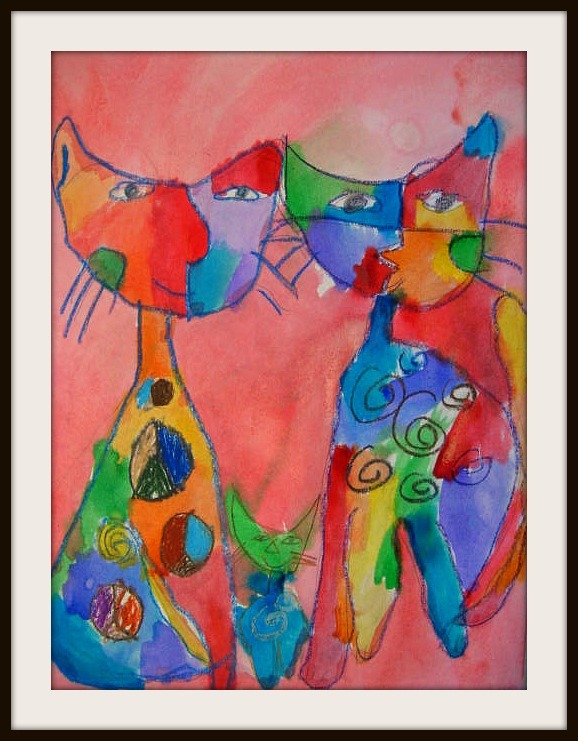 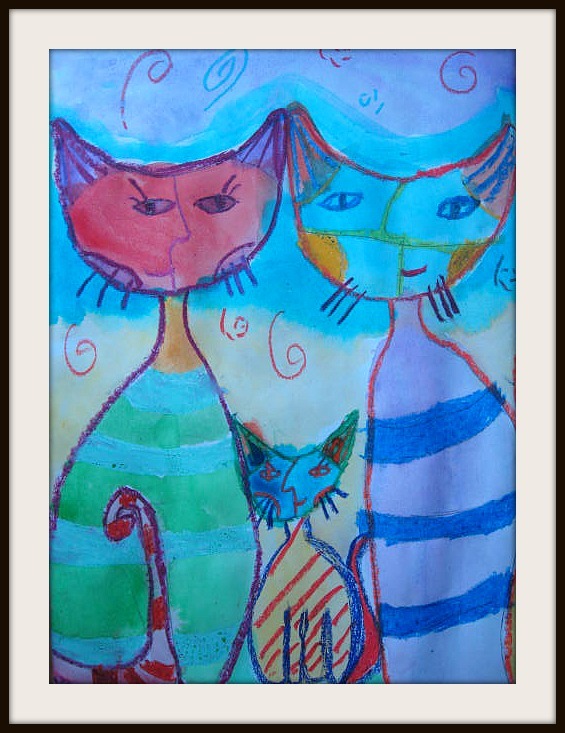 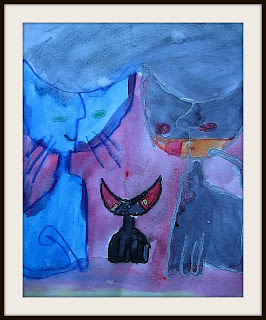 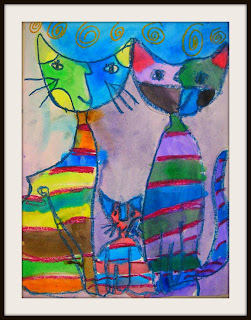 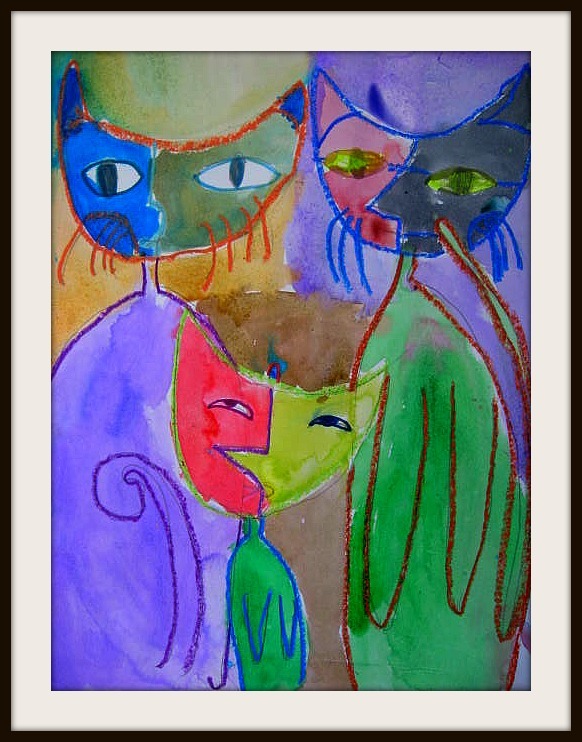 I encouraged them to really have fun with color.I think my 1st graders did a wonderful job creating a trio of cats in the spirit of this artist who now lives near Rome surrounded by her many beloved felines. 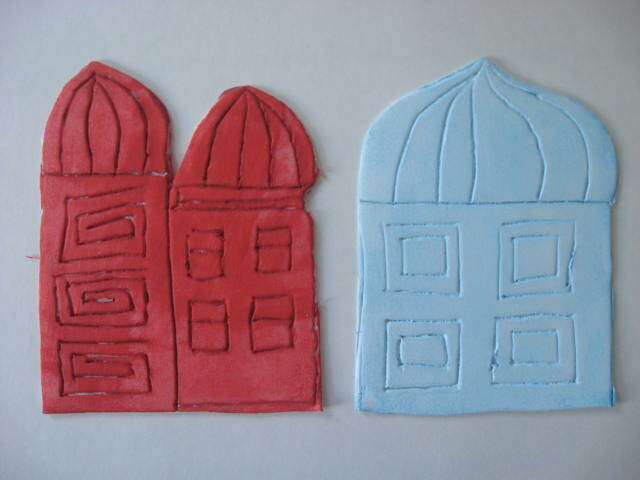 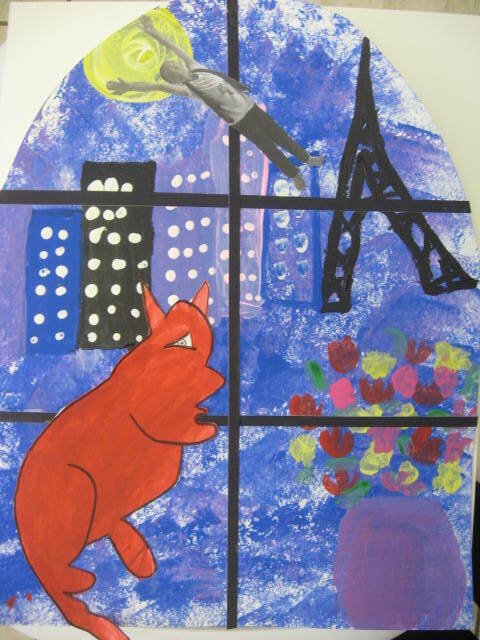 Here are some of the finished pieces inspired by Marc Chagall's "Paris Through the Window". The emphasis of this project was more conceptual than technical, so I gave the children quite a bit of freedom in creating a window into their own dreamlike city. 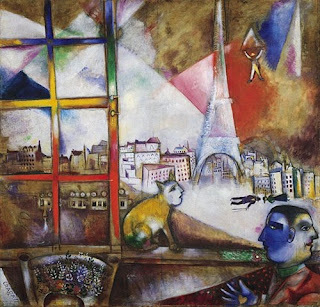 But we discussed Chagall's frequent use of Paris, animals, glowing suns and floating people. They are are wonderfully unique! 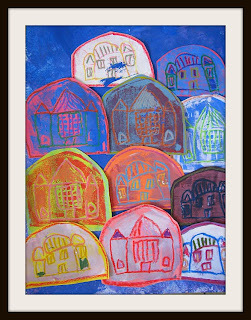 These were created by kindergarten-5th graders. I felt I was overdue for a self portrait lesson with some of my younger students. 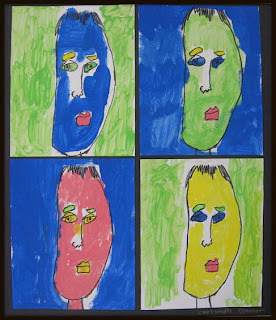 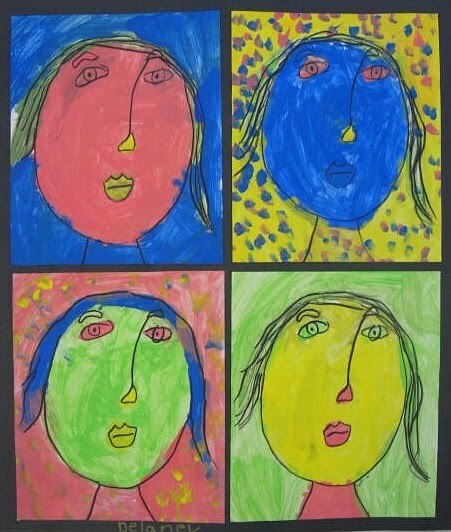 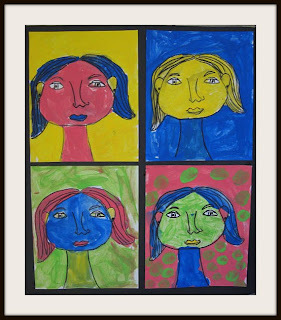 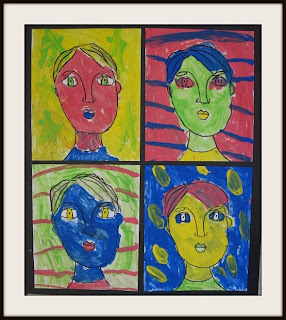 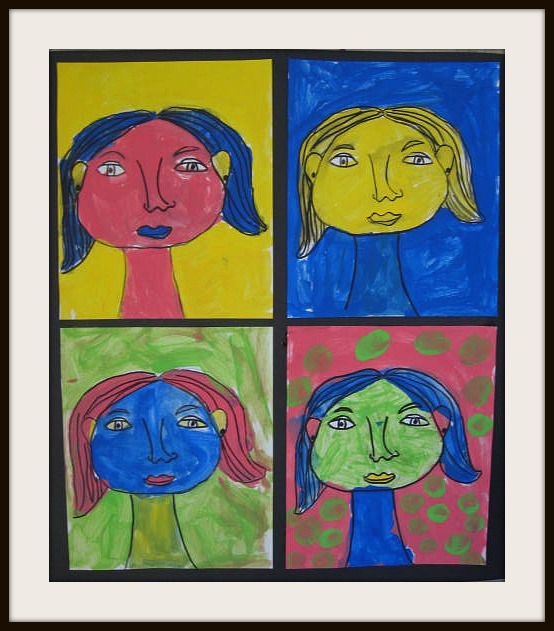 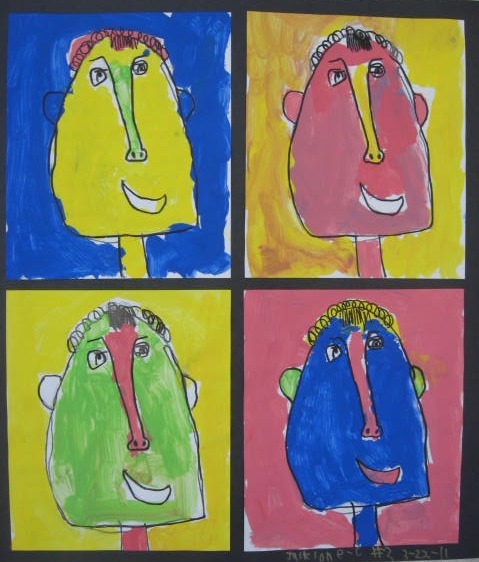 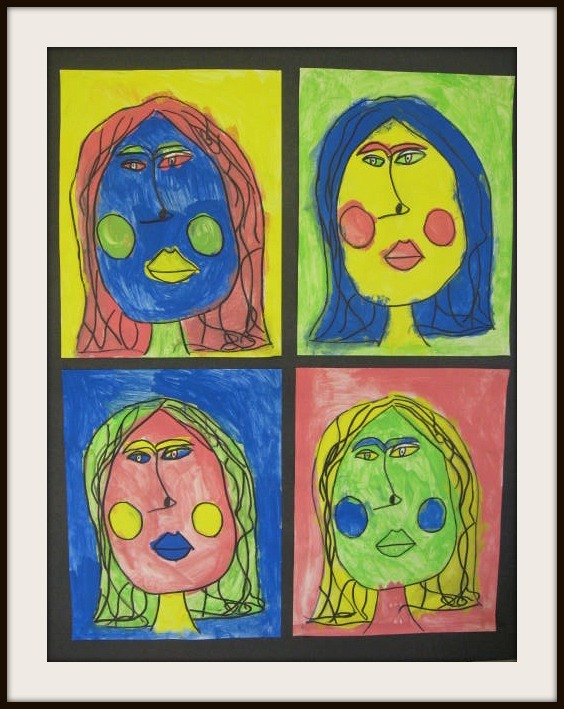 My kinder and 1st graders created a pop art series of self portraits. After following a simple line drawing lesson, they darkened their lines with permanent marker. 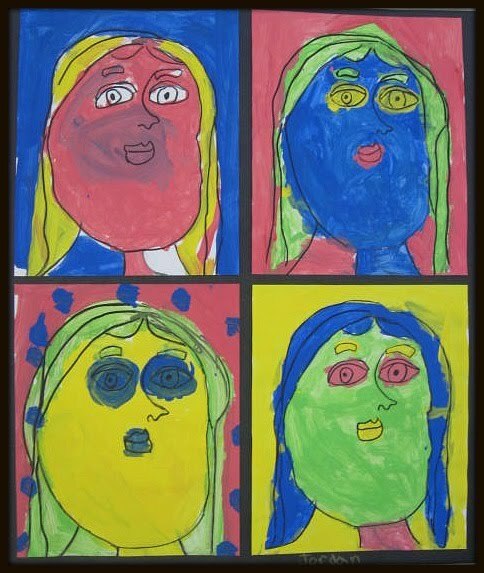 I scanned these drawings on thick card stock, giving each child 4 copies. 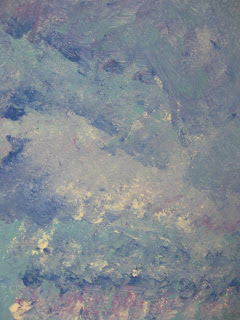 They were only given 4 colors of acrylic with which to create 4 unique color combinations. 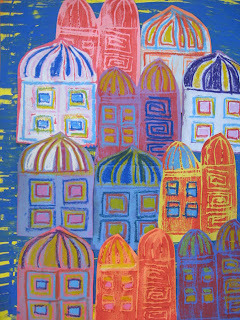 After dry the lines were gone over again to create a graphic look. The above pieces were created by kindergarteners and 1st graders. 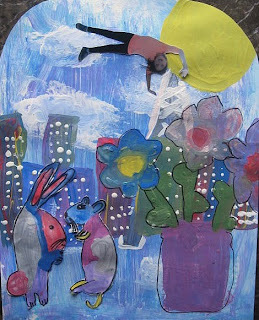 I was very excited to introduce my students to the art of Marc Chagall this session. 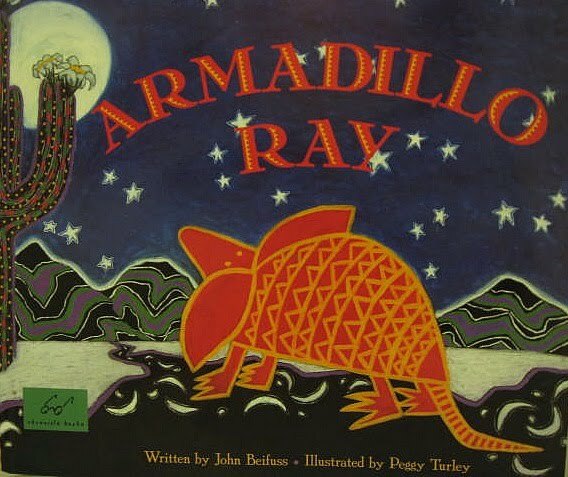 I found a wonderful book geared towards children. 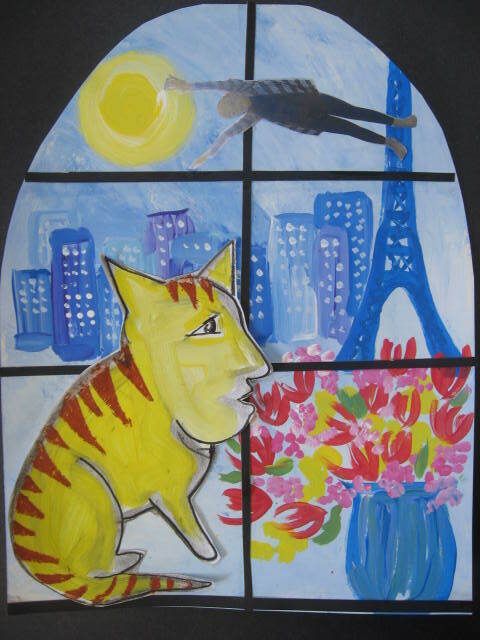 (Dreamer From the Village by Michelle Markel) It does a fantastic job of detailing his upbringing in Russia, the impact his devoutly religious Jewish background had on his art, and his awakening as an artist by the modern center of art, Paris. We looked at his painting Paris Through the Window to create our own inspired versions. 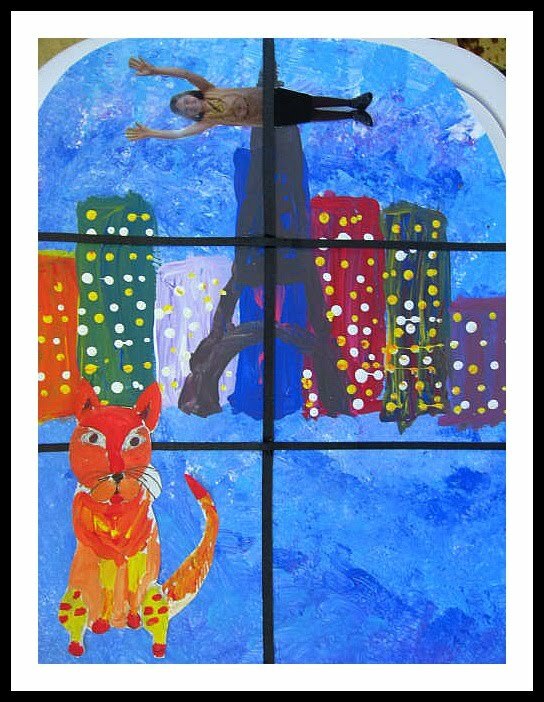 We also talked about some elements that you see often in Chagall's work, vibrant suns, floating people, animals and flowers. Chagall painted his world of dreams, fantasies and memories. 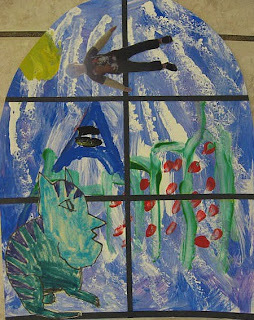 My 3rd thru 5th graders created a dreamlike sky base using sponges and acrylic. 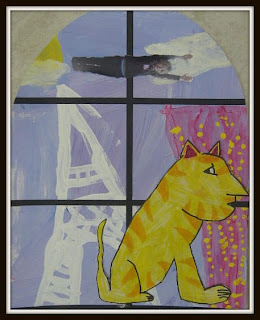 Painted cities, glowing suns, surreal cats (or other animals) and flowers were added to create their own window into their dream scape. 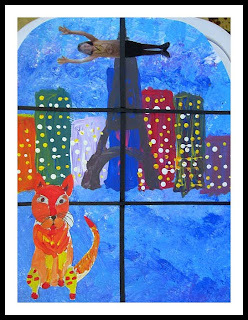 The last step was to add strips of black posterboard to create window panes and a photo of them flying. They are really enjoying creating these pieces. 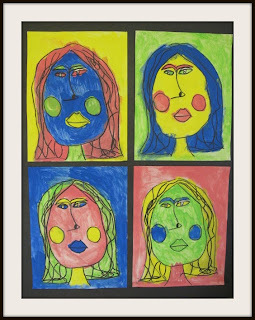 More to post next week as they complete them. 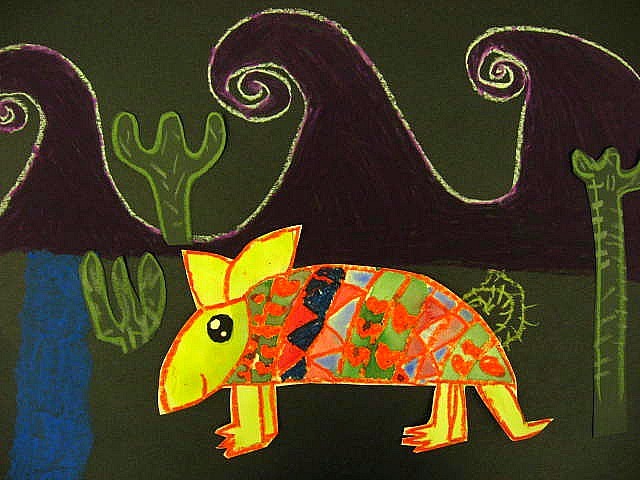 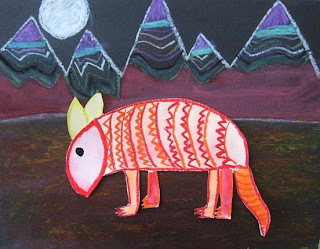 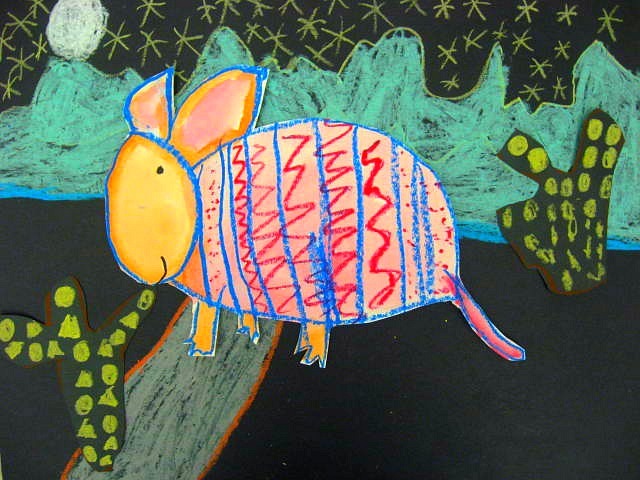 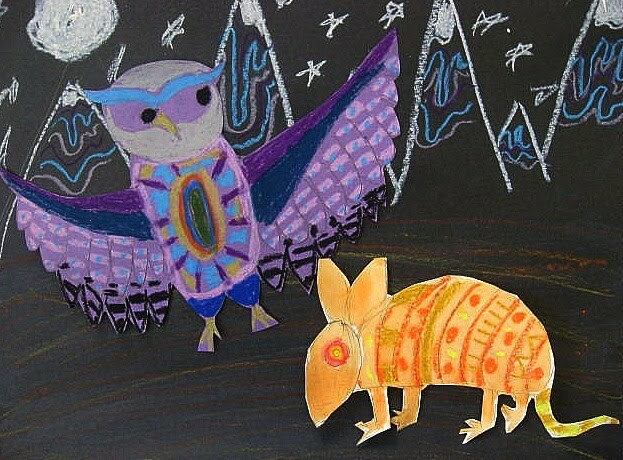 This week my students are looking at the wonderful oil pastel illustrations of Peggy Turley in the children's book Armadillo Ray. 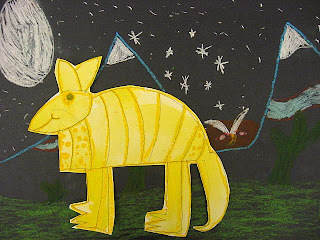 The story follows the curious Ray as he wonders the desert and ponders the many shapes of the moon. 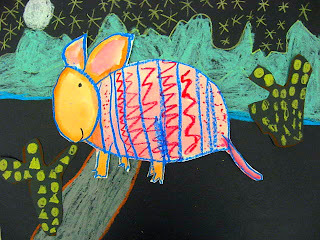 Turley's illustrations are full of patterns, shapes, and vibrant colors against the nighttime sky. 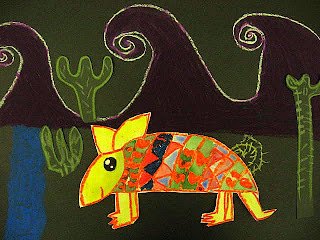 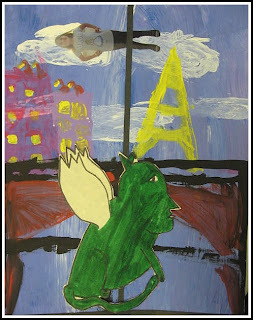 My Kindergarten through 4th graders first created Ray using oil pastel and watercolor. While these dried they used oil pastel to create their desert landscape. 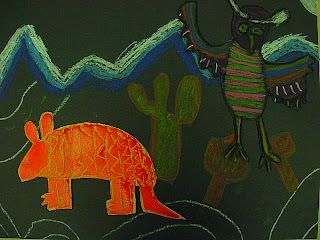 Some added tumbleweeds, cactus, desert owls and of course that curious moon. 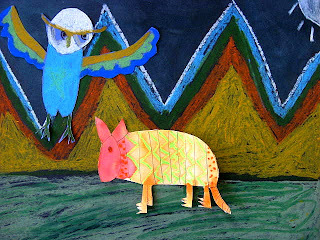 You know you've taken too long to enter a new blog post when your mother calls and tells you, "I'm tired of the Lorax, you need to put something new on there" Ha! Well during this 6 week art session my students are creating works inspired by two children's books (The Lorax and Armadillo Ray) , several artists, including Marc Chagall and Hundertwasser), and a couple other projects. 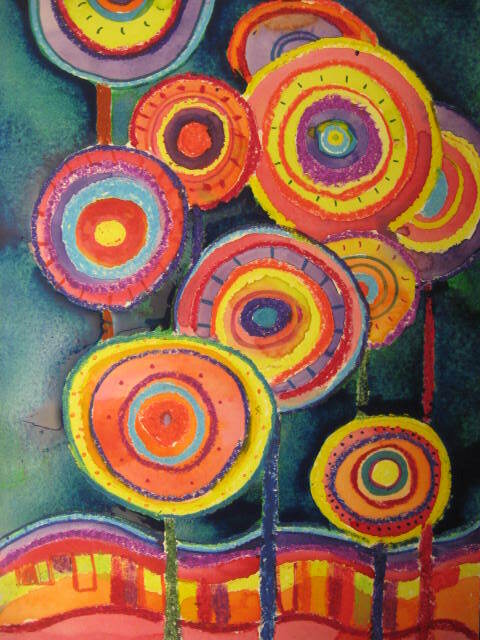 I purchased a wonderful book "Harvesting Dreams, Hundertwasser for Kids" by Barbara Steiff. 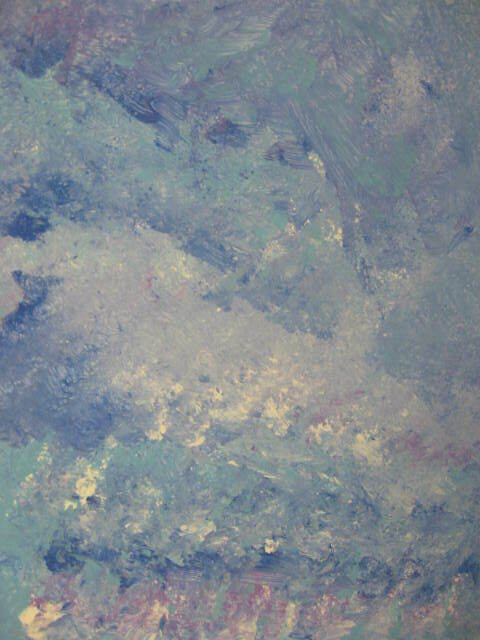 It playfully highlights this very unique artist's take on the world and a bit of insight into his instantly recognizable works of art. 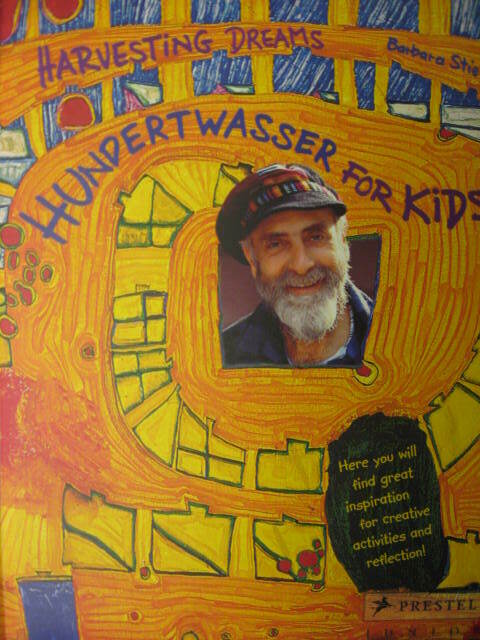 I hadn't known that he was born, Fritz Stowasser and changed his name to Freidensreich Hundertwasser, German for: Kingdom of Peace Hundred Water. (Later he threw in 2 more middle names Regentag Dunkelbunt, meaning Rainy Day, Dark Bright. 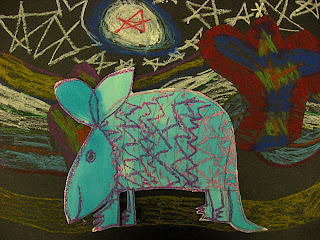 I have had fun exploring some ideas to capture his love of nature, "dark-bright" colors and curved lines. The bottom piece is a straightforward oil pastel and watercolor resist that mimics Hundertwasser's other-worldly gardens and repetition of line. 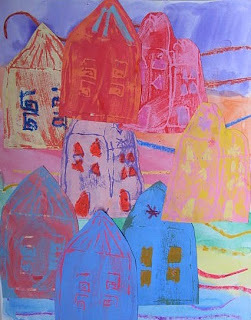 The top pieces are collage prints created with two styrofoam plates. 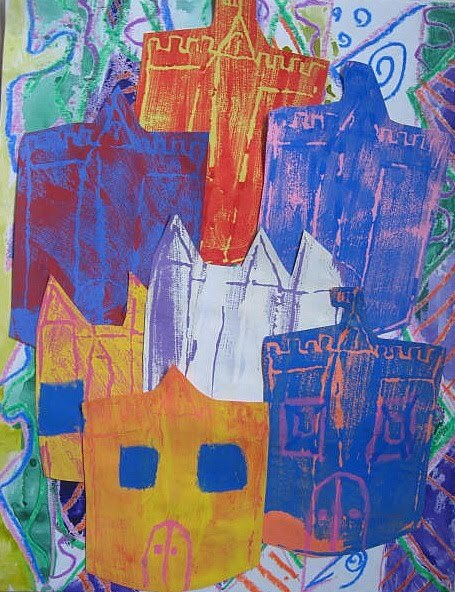 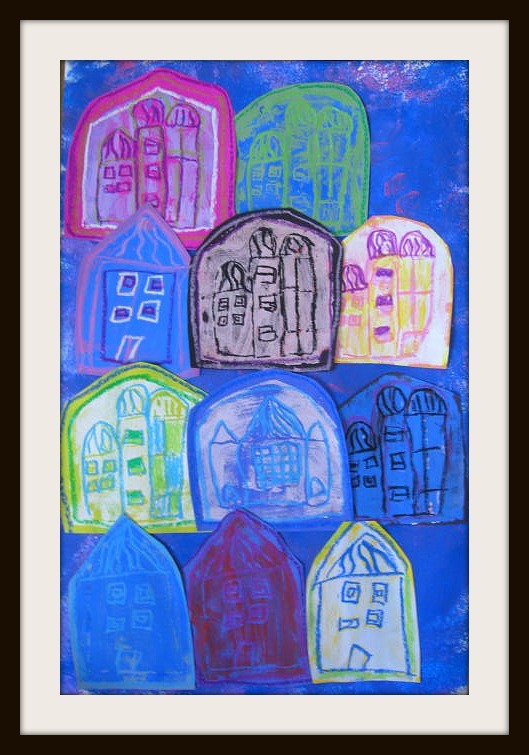 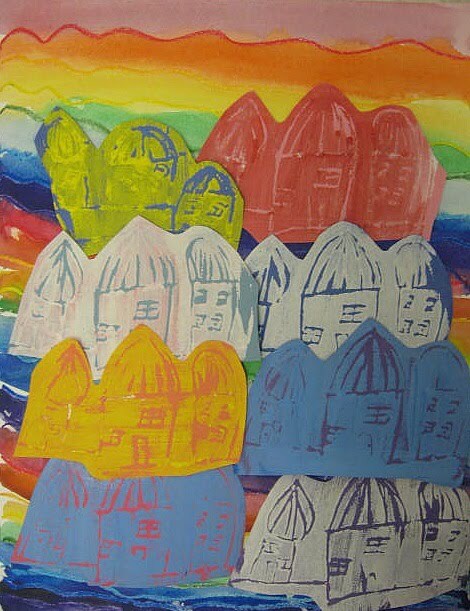 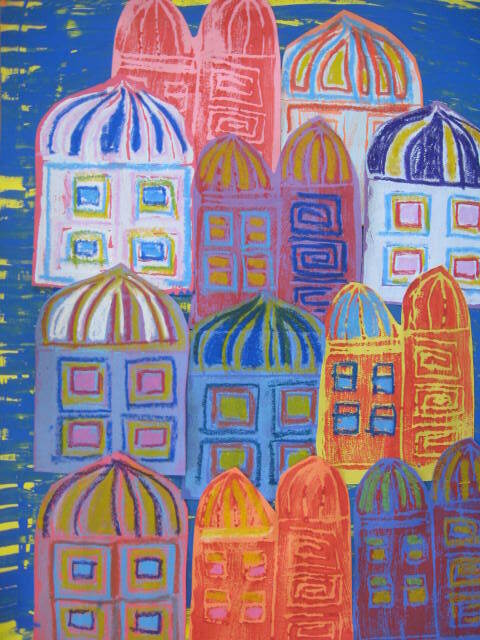 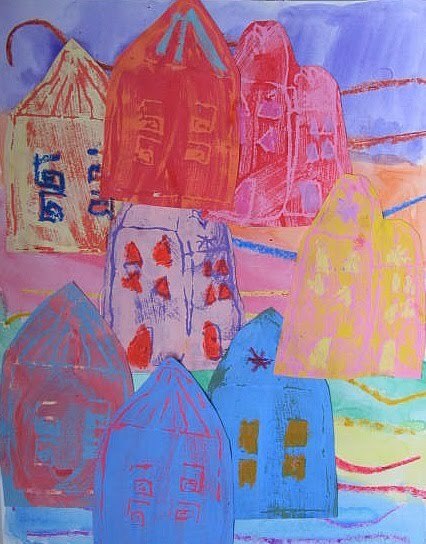 These Hundertwasser inspired villages were created using acrylic prints on carved foam on a variety of colored construction papers. The prints were cut out and highlighted with oil pastel. They were layered to create a city-like feel. This project was inspired by these pieces from Artsonia from a school in Hong Kong.